This is my one year anniversary of Sewing Myself Stylish. Have I sewn myself stylish yet? I would say not, but I’ve learned many things and had a lot of fun. Bit by bit, I will share my insights of sewing for myself again as well as my observations of the online sewing community and social media from the perspective of an “older” gal. But for now, I would just like to share with you Fresh Make #22, a comfy, versatile dress that I could wear a number places. 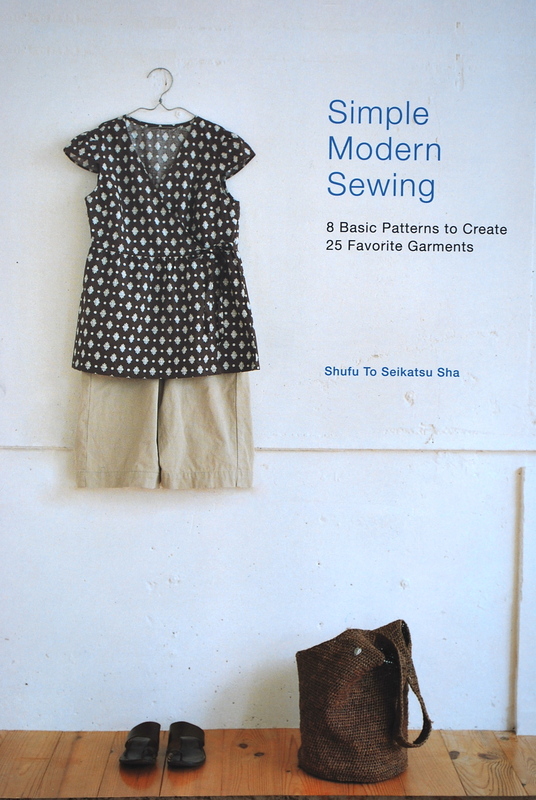 I did my occasional veer of the Big Four path for this one and used a pattern from the book “Simple Modern Sewing” by Shufu To Seikatsu Sha ($24.95). I am normally not compelled to buy these kinds of books because I am leery of the actual pattern drafting and fit of an unproven designer or company. BUT, my husband gave me a gift card for Interweave, so I took the opportunity to purchase this book which had not made it’s way to the 75% off section yet. 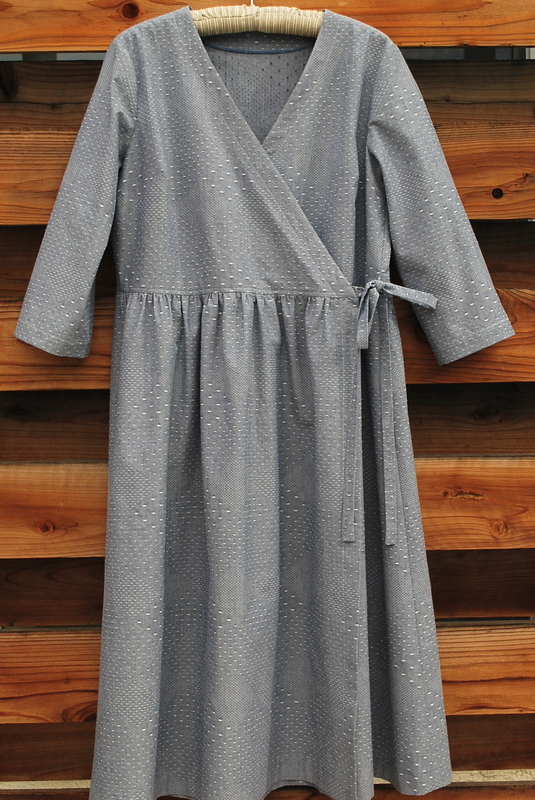 I was immediately attracted to the Wraparound Dress with Three-Quarter-Length Sleeves. 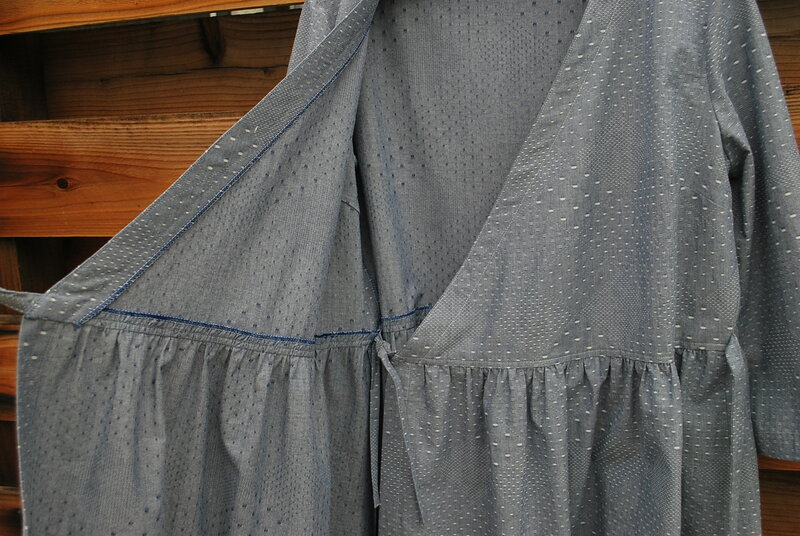 It looks like a dress I might have worn in college in the 80’s, or wear now, as a teacher dress. The directions in the book are minimal. 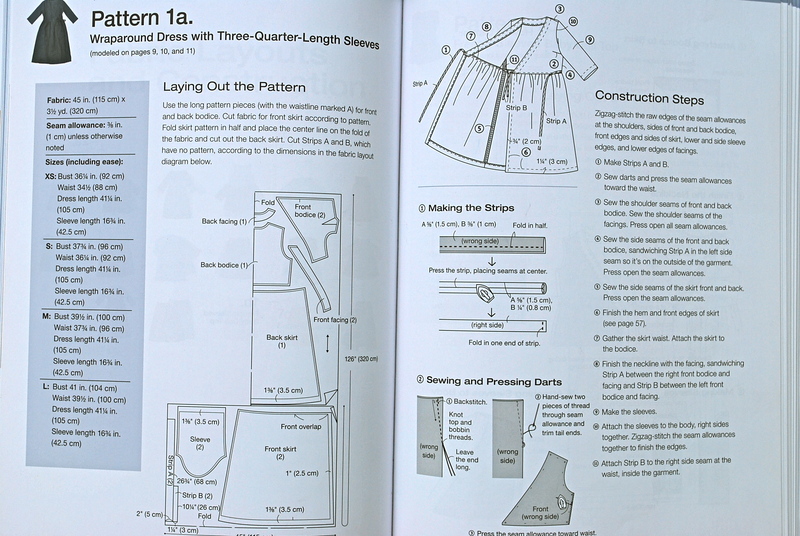 I wouldn’t recommend sewing patterns from this book unless you had basic knowledge of dress construction and/or weren’t planning to rely solely on what was provided in the book. 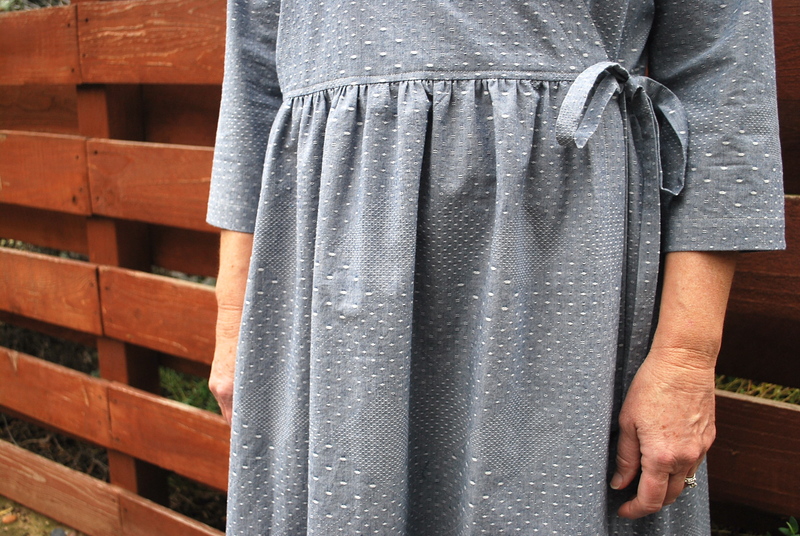 The fabric I chose is kind of a textured chambray cotton from Michael Levine’s in DTLA. It’s about 58″ wide, and I purchased 3 yards at $15.00 per yard. It appeared to be a high quality cotton and was lovely to sew with. I like this fabric because it’s a basic with a bit of a twist. 1. Obviously for this pattern, the most crucial measurement for determining your size is the bust. I am spot on for the Medium with a bust measurement of 35 1/2″. I cut the Medium and the dress fit me very well. So, here’s a word of warning to larger busted gals- Large is the biggest size with a bust measurement of 37″. 2. On me, the point of the dart is about an 1″ too high. If I make this again, I will reposition it. Fortunately the style is such that it’s not that noticeable. 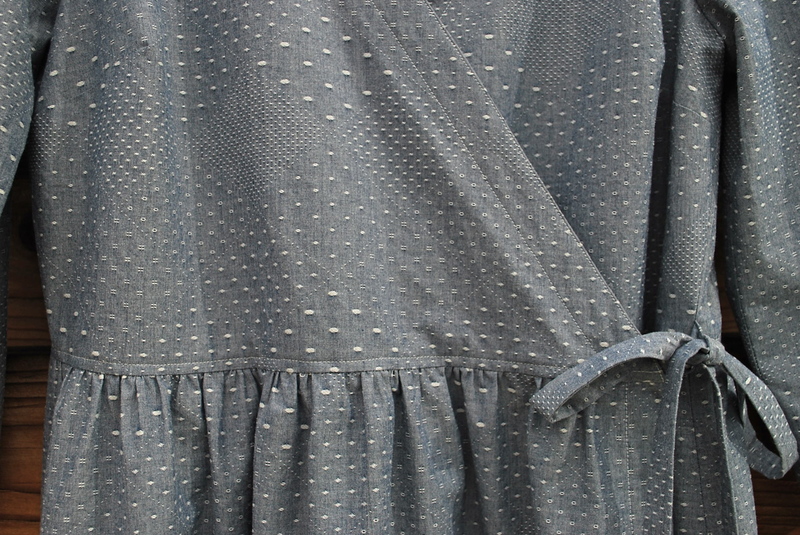 Also the texture and pattern in the fabric help mask this as well. 3. I am pleased with the accuracy of this pattern. It sewed up just like it was portrayed in the photo. 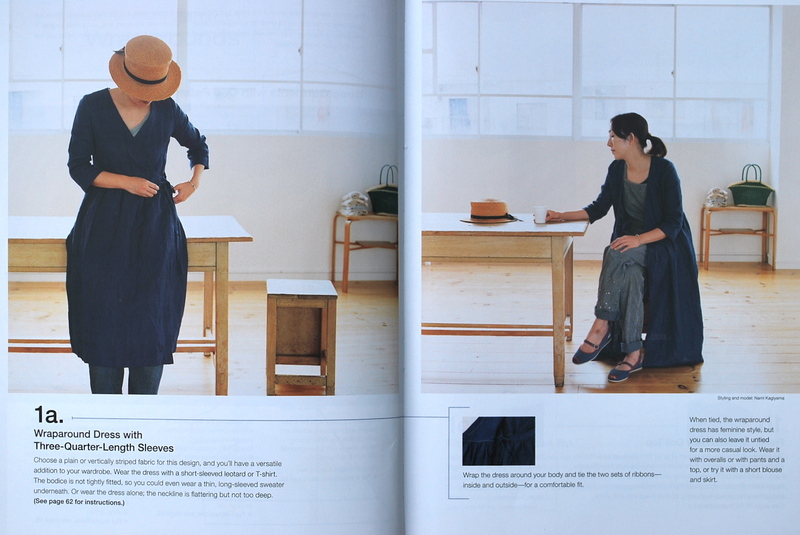 I realize this is a classic Japanese pattern, and obviously the author of this book had access to a well drafted one. I am planning to try other patterns in the book. 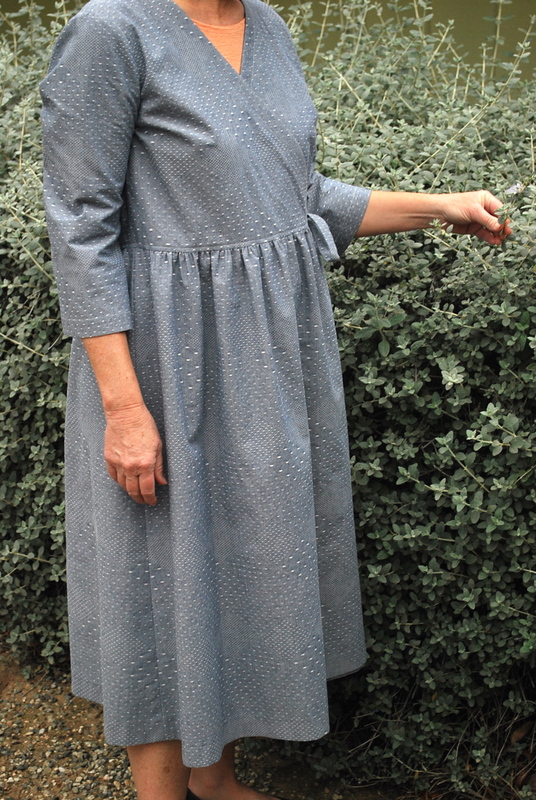 I already have a fabulous linen fabric for a skirt. 4. 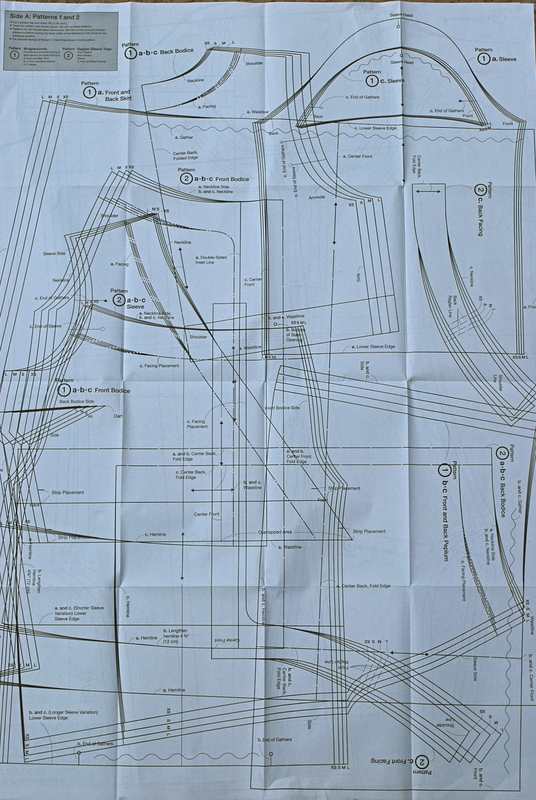 When tracing off this pattern from the master sheet, you need to be up for figuring out which lines go to which pieces as several pieces are overlaid on each other. 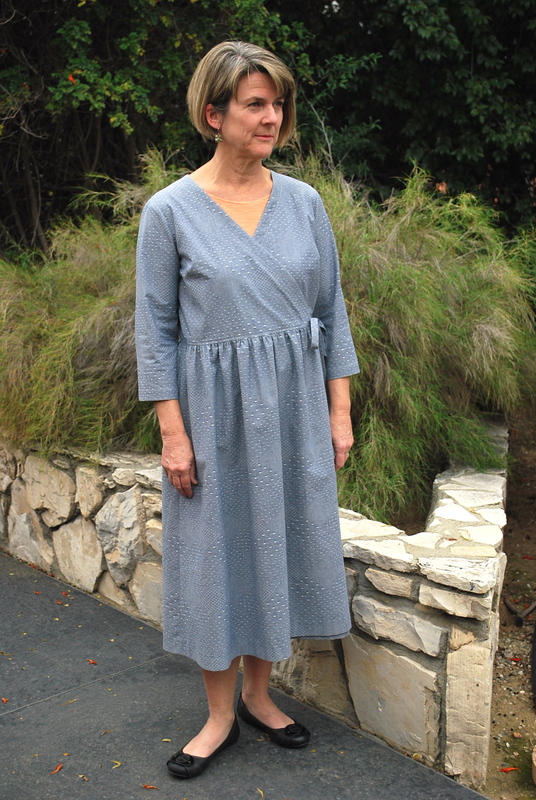 This entry was posted in Dresses and tagged dressmaking, garment sewing, Interweave, Japanese sewing pattern, Michael Levine, pattern review, sewing, Shufu To Seikatsu Sha, Simple Modern Sewing, wraparoud dress. Bookmark the permalink. Lori, I’ve often wondered about the Japanese pattern books and I enjoyed reading your opinion. 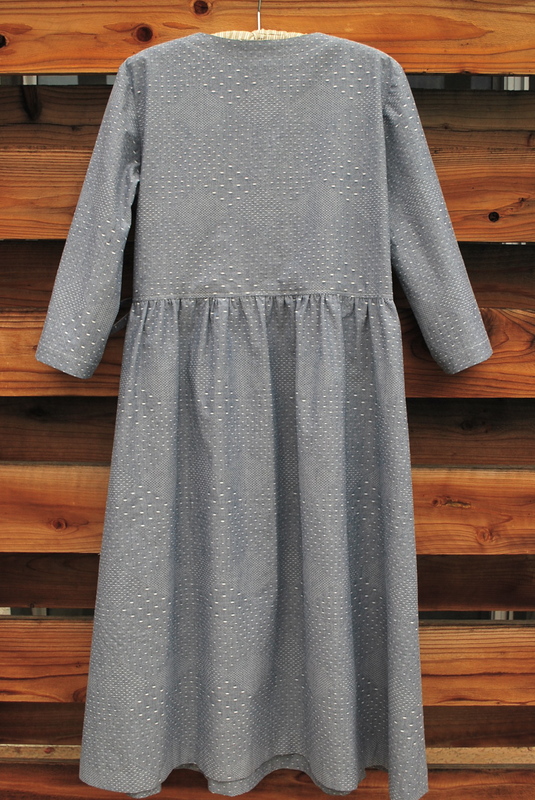 As usual, you’ve used a cool fabric to create an impecably made dress! Congratulations on the anniversary of your blog! Thanks, Pam! I also have a Japanese bag and purse pattern book, and found the instructions incomplete and hard to follow. So I was very happy to discover that at least the one pattern that I tried so far is well drafted. Happy one year anniversary! Great fabric, it’s simple yet interesting. Thanks! The minute I walked by this fabric, I knew I had a have it.